As Google is shutting down the most loved Inbox App on 2nd April and it has not brought any of its popular feature to its main Gmail app which will be used as an alternative. So after many complaints, it seems that Gmail for iOS is getting a new feature i.e. Customizable Swipe Actions. This feature will allow users to choose what happens when they swipe on any email. It is a good feature as now users will have at least one less thing to complain about. 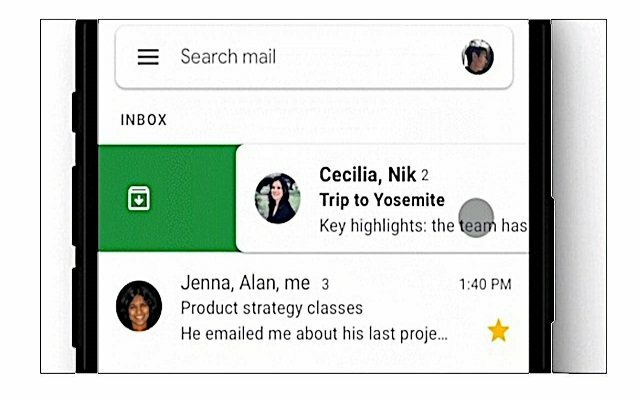 Customizable swipe actions feature is already available for Gmail for Android. This is one of the features which is inherited by Inbox. Google is gradually adding new features to its Gmail app in order to improve the bad experience of users with this app. Some of the Inbox new features like auto-generated replies to simple messages are already integrated into the Gmail app. Just a few days back, Gmail got another new feature that allows users to schedule the email. Android Users have always remained lucky when it comes to Gmail App. Gmail received a major redesign a few days back which is still rolling out to some users. The new update has brought the ability to quickly view attachments without having to open or scroll through a conversation. In addition to that, smart compose allows users to write emails faster than before. Even though, replying to messages have also become quicker with smart reply feature. Recently, we have come to know that, Google is working on some new inbox feature for Gmail For Android as well.